Savory. Crunchy. Super freakin’ delicious. Tahini Roasted Almonds are a daily dose of yum in my mouth. They can be a dose of yum in yours, too! Almonds and tahini are both brilliant sources of calcium. If you’re looking for a nutrient-dense, portable snack, these are the way to go. My husband and preschooler love Tahini Roasted Almonds, too. I store them in a mason jar on the counter so they’re always handy for a quick snack, meal side, or impromptu picnic. They would be great for packing your kiddo’s bento box! More reasons to eat tahini from MindBodyGreen. 1.Preheat the oven to 375 degrees and line a baking sheet with parchment paper. 2. In a medium bowl, combine almonds and tahini with a spoon until the almonds are evenly coated. 3. Spread the almonds across the baking sheet evenly. Make sure none are piled on top of each other! 4. Roast in the oven at 375 degrees for 10 minutes, then turn off the oven. 5. Let the almonds to sit in the oven for at least one more hour. This will allow the tahini to dehydrate, leaving you with unsticky almonds. Hurray! 6. 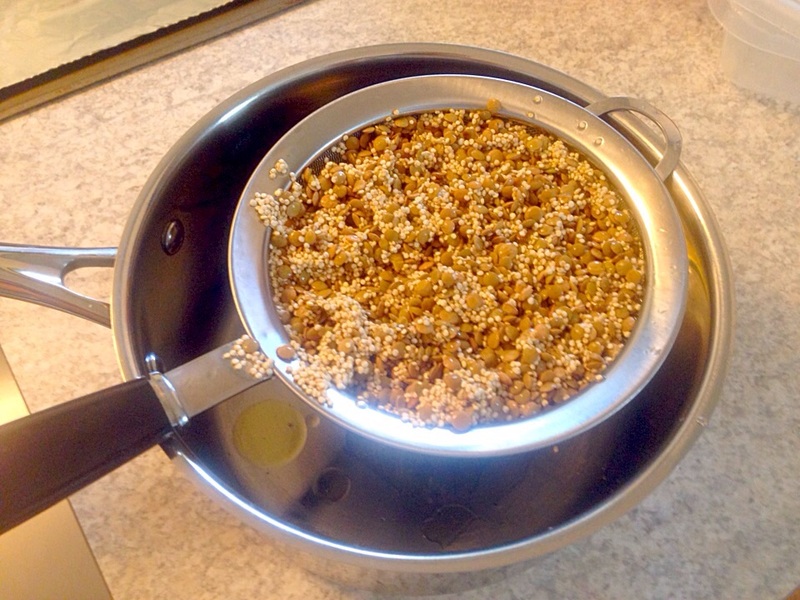 Remove the almonds and store in a tightly sealed container for up to two weeks. So in my daily visits to the NICU, the nurses would often shoo me out the door to take a break and refresh. On one particularly dreary March day, I ventured out to Panera Bread and discovered their new menu addition. Broth Bowls. Oh. Yum. I ordered a Lentil Quinoa Broth Bowl and boy, did it hit the spot. Warm, filling, and just the right amount. I felt healed and energized afterward. Best of all, it seemed easy to recreate at home. This is a versatile dish; I have enjoyed this bowl for breakfast, lunch and dinner. Plus, it’s a good meal for a breastfeeding mother, as it includes whole grains, legumes, and dark leafy greens. Measure 1 cup of quinoa and 1 cup of lentils. Rinse thoroughly. Toast in 1 T of oil for a couple of minutes. Add 2 cups of water, let come to a boil, and cover, simmering for 30 minutes. Toss in enough torn kale to fill up the pot. (I’m using a 3 quart saucepan here. You could definitely go bigger and probably should, as I usually end up adding more kale later on.) 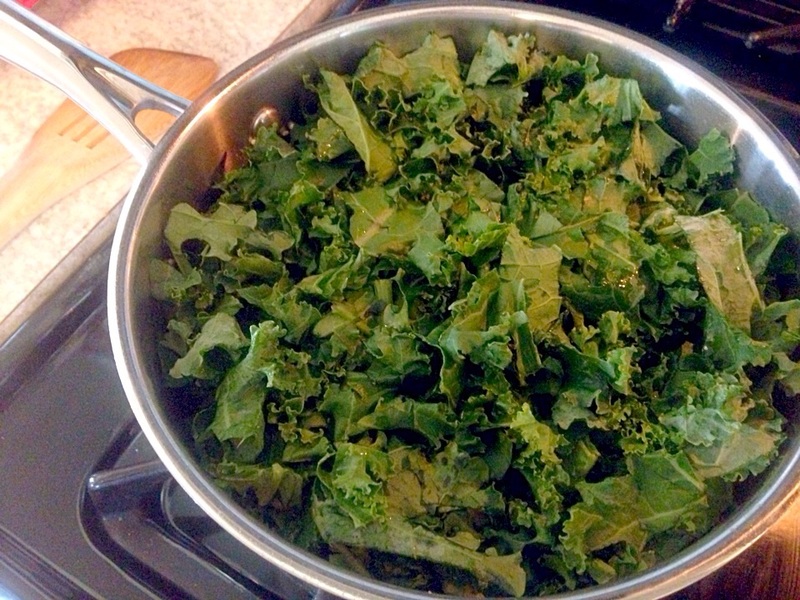 Cover the pot and let kale steam until wilted, about 10-15 minutes. Boil some water. When boiling has ceased, mix about ½ cup of the water with 2 tablespoons of miso. Mash miso with a spoon and combine with water. 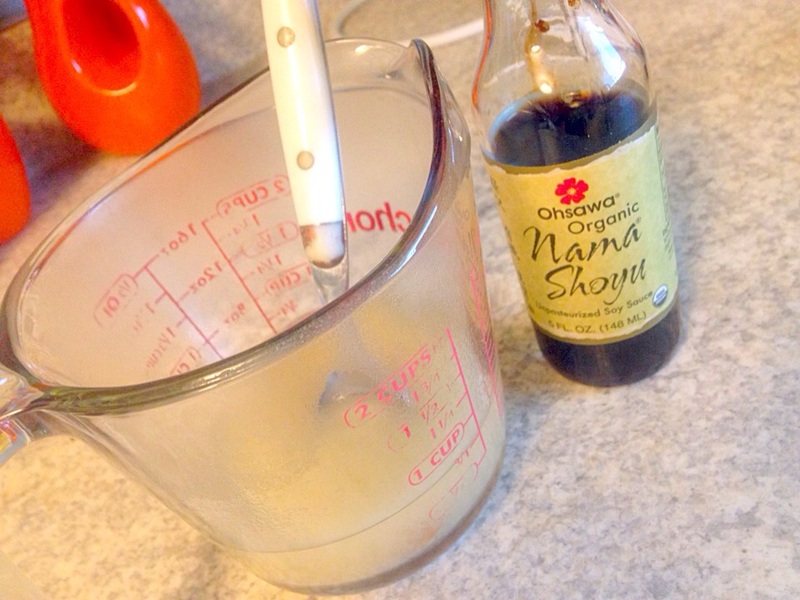 Add ¼ cup of soy sauce or similar (tamari, shoyu, or liquid aminos). Pour soy/miso mixture into the saucepan. Add another 4-6 cups of water and continue to simmer for ten or so minutes to let flavors combine. I remember summers. Waking up to bright sunshine and birds chirping, the lazy roll of a breeze coming through my bedroom window. The fresh smell in the air and the distinct promise of a beautiful and endless day. I grew up in the countryside of a rural town in a rural county. There was nothing upon nothing, just gently rolling hills, leafy trees, dirt roads that gave way to fields, woods and streams. My brother and I had free range to go exploring, like most kids we knew. We’d go for walks to pick up cans on the side of the road, which we recycled later for change. Our cousins would ride their bikes to meet us at a bridge halfway between our houses, several miles over rough fields, but our only mode of long-distance travel at that age. We would strip off our socks and shoes and wade in the creek below to cool off. Sometimes my parents worked the second or third shift, and my brother and I would stay with my grandparents for three or four days at a time throughout the summer. Grandma and Grandpa lived in the same village, in a different parcel of countryside. Life revolved around the farm and its work, with early pancake breakfasts and picnics carted out to the cornfield at noon. We sat at the edge of the field under the trees, eating ham sandwiches and cantaloupe, drinking sweet tea out of a canteen. Every summer I either attended or helped with Vacation Bible School in the village’s only church, an organization to which my family was tightly bound. Each morning that week was filled with songs and nature walks and free ice cream cups from Prairie Farms. It was a bustling time for the children of the community, because most of them didn’t actually attend our church. Events for children, especially ones that provided free childcare, didn’t happen often. This was a special time for kids and parents alike. The first Saturday in August heralded the town’s Fish Fry, a day of fanfare in our tiny hamlet. The volunteer firemen spent the day frying up fish, while people from surrounding towns flocked in to eat potato salad, coleslaw, and homemade pies and cakes. There was always a band, and a beer tent, and kids’ games. Sometimes a group would set up a dunk tank as a fundraiser. The day was spent in comings and goings, riding my bike into town and back home again, reveling in the unusual amount of people and activity. My husband experienced this same kind of freedom growing up in a town that houses the state university. His mom gave him the boundary of streets he needed to stay within and told him to come home when the old-fashioned lampposts lit up. He and his friends would roam the cobblestone streets, playing pranks and making snack runs to the nearest convenience store. When it was hot, they found plenty of shade under the century-old trees lining the streets. It was not unlike the childhood recounted by Bill Bryson in The LIfe and Times of the Thunderbolt Kid, even though it took place nearly forty years later. As an adult, I still find summertime glorious, especially the dawn the each day. Sometimes I actually break out into a rendition of “Oh, What a Beautiful Morning.” Indeed, there is a nostalgic quality to summer that makes me want to watch lovely summertime musicals like Oklahoma, The Music Man, and especially State Fair. The days may be glorious, but are most often spent inside, battling cruel amounts of air-conditioning. I have resigned myself to summers spent working, because that is the kind of career I have. What I have not resigned myself to is the kind of summers my son might have. Much talk has been generated over the loss of childhood freedoms: they don’t walk or bike anywhere alone, they don’t play freely or utilize their imagination, and playgrounds are childproofed to the point of no fun. I’m not going to talk about that, except to say that I think a boomerang effect has begun, and I don’t think that this tendency toward overprotection, by parents or society in general, will continue. Here in the suburbs, it seems that most children attend a day camp of some sort during the summer. This kind of organized activity runs opposite of our free-wheeling childhoods, and I think it will likely be where my son spends his summer days. Day camp certainly isn’t a bad option, and yet it sort of seems like school in disguise. Where will he learn to make choices about what to do with his day, when the decision is already made for him? Every. Single. Day. My true hope is that he will be able to spend significant amounts of time downstate with his grandparents, where free time for children is still a large part of life. There he can experience the fullness of summer days and the endlessness of nature. He can fish in the pond, build a fort in the woods, wade in the creek. He can decide what exciting thing will happen that day. Then he’ll have a taste of what it was like. He will know. Happy weekend! Here's what I've been looking at. How to Understand an Introvert (as explained by Introjis) - via Introvert, Dear - The best summary of introversion I have ever seen. Scientists Aren't Immune to Gender Bias - via Futurity - Just another sign that we can do better. Wet Hair Styling - via The Beauty Department - Summer is drawing near, and I am looking forward to letting my hair air dry. Think Big, Love Small - via Momastery - Glennon shares a heartfelt letter to a hurting teen. What’s the best thing about turning thirty? While I don’t really know, I feel like that’s the point. The thirties hold a different kind of promise than the twenties did. The exploration, the course-setting, the “who am I/” has given way to a deeper, more established path of life and identity. Here are some of the reasons why I’m happy to verge on a new decade. Thirty feels like an accomplishment. Somehow I feel that I’ve made it. At thirty, I know things. There is wisdom in this mind of mine. There is a considerable amount of experience to draw from. Some things I’ve learned: the perfect time to go to bed; how to make my needs heard; how to birth a baby! Some things I have still not learned: how to change a tire; how to grow vegetables that actually produce a harvest; how to french braid my hair (or do pretty much anything with my hair, alas). I’m not in my twenties anymore. Let’s face it, being a twenty-something is not always fun and games. The twenties often involve a lot of messy, life-shaping decisions regarding education, career, and relationships. Building this foundation is really stressful and overwhelming, hence the Quarterlife Crisis. Goodbye to that. It’s another milestone birthday. Usually I don’t go in for big birthday celebrations; a dinner out with my husband has been the standard for the last seven years. Having an excuse to honor myself is especially needed now that I am fully entrenched in parenthood. The last time I had an important birthday was nine years ago. Thankfully, this birthday will be much different from my twenty-first. Dancing around a bar called Shenanigan’s while guys buy me shots of Wild Turkey (eeewwww!) sounds like zero fun now, and it wasn’t that much fun then (see above). I will be doing dignified grown-up things like going to the theater and having brunch, thankyouverymuch. I’m finally growing into myself. People have told me all my life that I have an old soul, so this is a bit like playing catch-up for me. It feels good to become older, wiser, and more me. After all, for years I’ve heard people say they are happiest in their thirties, so I feel like I have a lot to look forward to. No, the physical side of things is no picnic. Last summer, I saw a picture of myself smiling and thought, “Crow’s feet! Seriously?” I have to get past it, though. Life is life, and I’m here to live it. I know that in many ways, age is a rather arbitrary factor in what life brings you. There is nothing magical about being thirty that will keep me from dealing with problems I faced in my teens and twenties, or those I might face in forties, fifties, and beyond. All I'm saying is, the view looks pretty good from here. Celebrate Easter with this free printable! Happy Easter to all! I started reading Gretchen Rubin's new book, Better then Before. In it, she writes about forming habits. The part that I was reading spoke to the difficulty of beginning. The first step requires nothing special, really; there is no secret in how to begin. There is no need to wait for the perfect day/time/whatever. Just do it. That is something I have been struggling with in starting this blog. I have found myself putting off the writing part of it in order to work on the aesthetics. Ooh, I need the perfect header. I don't like this background. I have to add my Pinterest board to the sidebar. Because naturally no one should view my blog in less than perfectly-ready form. Of course, I have taken the first step. I did write a little a bit already. Then I got sidetracked, and maybe a bit scared. Rubin's book also addresses the phenomena of how, when we think about whatever it is that we've been putting off, it makes us feel bad and we push it to the back of our minds even more. This has certainly happened to me. When it comes to writing, I find that my clearest, best thoughts come in the earliest hours of my morning, which can be a pretty crazy time of day. Hunter wakes up at 5:30 and then there is the whole getting-ready routine. If I can get out of the house early enough, I try to squeeze some writing time in before work. A lot of days this doesn't happen, though. Often I'm left with maybe only ten minutes, and I dismiss it as not being enough time. Or I decide to devote myself to other matters. There is always something else. More often, I end up with time to write later in the day, but I don't even try, because I think I can't gather my thoughts well enough to make it worthwhile. I can do it, though. I just have to remind myself why. One of my most deeply ingrained habits is walking every day. Throughout college, I walked or biked to campus and work every day, and since starting my current job over six years ago, I've walked at least twice a day, with fifteen minutes at lunch and fifteen minutes before or after work. To make this happen, I've had to arm myself with certain things: tall, fur-lined snow boots; a heavy down coat for those awfully chilly below-zero days; quality gloves, hat and scarf; an audiobook to listen to because it helps me zone out from the sometimes terrible weather. On top of this, I remind myself why I should walk. Being outdoors and breathing in fresh air energizes me and clears my head. It brings more inspiration to my work. The extra blood flow revives me in the middle of the day. It's good modeling for my son. And of course, health reasons. .
Making a deliberate choice to do something every day (or every week, or however you slice it) can be extremely difficult, especially when it requires managing your time in a certain way. Every day. Forever. It's an intimidating thought. That's the way I viewed parenting before I actually became a parent. I always knew I wanted to have children, but when the time to start saying "When?" rolled around, I wasn't quite sure when the right "when?" was. I was enjoying the carefree life my husband and I had, and wasn't so sure I would like to give it up. The other couples in our small group were trying, so we began thinking about it more. Was now the time to decide that we were going to try to add someone to our family, someone who would need us every day, forever and ever? My husband and I took a favored approach to decision-avoidance: Let's just see what happens! And we promptly got pregnant. Cue the surprise. But at least I didn't have to make the decision. It was made for me. So many new habits have been formed because I forced my own hand into parenthood: rising early, managing time super-efficiently, spending less money on non-essentials. This doesn't seem to be something I can do with writing, though. I have to make the choice every day, the same way I do with walking. Writing isn't going to wake me up in the morning with its cries or tug on my leg in the evenings. It doesn't snuggle up to me with a book, squeal with laughter, or blow me kisses. I have to choose writing, and then take action. Hopefully, as I continue reading Rubin's book, I will find more answers about making my habit stick. For now, though, I will just have to remember to tell myself why it needs to happen...and then make it happen. What habits do you struggle to begin? What have you found helps you? I have been part of a fabulous small group for the last two and a half years. Boy, do I love these people. Through church events and friends, somehow we four couples came together to form a family. We were all about the same age, same life stage, and had similar worldviews and interests (It is important, for instance, to know that your fellow small groupers would be cool with having wine or beer at a meeting). 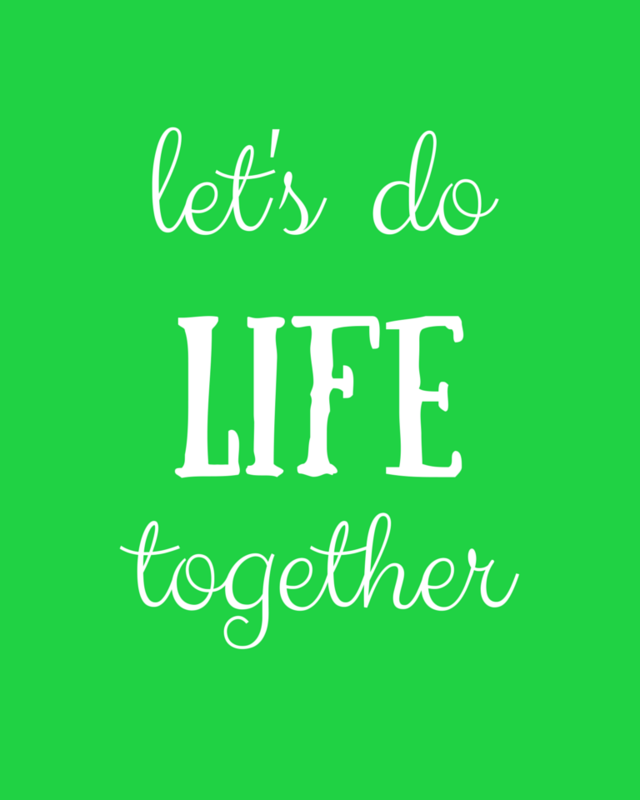 So in the fall of 2012, when we all started heading down this road of groupdom, it was often said that we were "doing life together." This was pretty meaningful for Husband and myself. We moved to Chicagoland after finishing our degrees and had a pretty flimsy support network. No family and just a handful of friends who lived in Chicago proper, so we saw them maybe once a month. Finally, after four years, we had found our people, our family. It was time to do life together. Our small group took this to heart. We shared our life stories, we went out dancing, we celebrated birthdays. And then...we all got pregnant. By some miracle of timing, we all had babies within five months of each other. It is hard for me to imagine what life would have been like these last couple of years if I hadn't been going through it all with my friends. Us ladies have sent so many group texts about pregnancy blahs, postpartum pain, and motherhood that we could probably compile it all into a book (although I am quite sure we wouldn't want to). Still, life got in the way. Parenthood changes a lot of things, and our group felt this times four. The last year or so saw a big shift in our focus (kids! sleep! ), and only recently have we all started to come back to a place where we can say we're all in. Some of this is because our babies are getting older, and some because we are feeling able and ready for more. We got a big dose of inspiration a couple of months ago, as our church was studying the early church, the Acts 2 church. There was a call to emulate the values and actions of this group of people, and the pastor shouted, "Let's do life together!" In this spirit, I made a set of printables featuring this phrase. I hope it acts as a reminder for me, and for others as well. It can also be interpreted as a motto for your family, or you and your partner. Whatever the case, choose your flavor below, as I've made two deigns and different colorways for each. The PDF prints out as an 8x10. , which ended its fabulous six-season run just a few weeks ago. This show has been a bright spot in my evenings over the last several months. I discovered its existence in September and my husband and I blazed through all six seasons just in time for the series end.
) Amber delivered her baby, an event that she had been scared about as a young single mother. But as Zeek and Camille stepped into the hospital room to see their first great-grandchid, Amber was sitting up on the edge of bed, happily bouncing her son and rocking side to side. Cue the record scratch. My husband, bless him, actually caught the absurdity of this. "What? She wouldn't be able to sit up like that!' I don't know. Maybe she would. At twenty one years old, youth is in her favor, but it still strikes me as unlikely. I certainly couldn't sit up without support right after giving birth, and I didn't have an epidural. My abdominal muscles were just exhausted, and ohmygoodness, everything hurt. 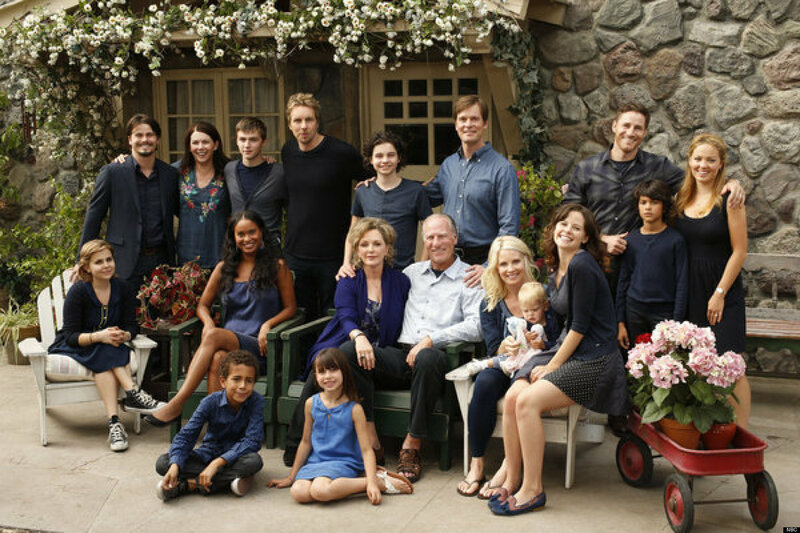 Something I have enjoyed immensely about Parenthood is that it touches on the reality of parenthood and family life in a way many shows do not. It is overly dramatic, yes. In almost every episode there is an overreaction of some sort, or an easily avoidable miscommunication. It's a tv show, so I will excuse that in the name of entertainment. But what I'm talking about are the things I've never seen on any other show, like when Kristina is preparing to go an important party while her daughter is still a newborn. She has trouble finding something to wear because she is breastfeeding and her dresses are not up to task of covering her ample cleavage. As this is happening, she talks about how she doesn't even really want to go, because she is tired and she will have to pump and she will miss her baby. To top off the evening, she is finally starting to enjoy herself at the party when she realizes that she has started leaking milk onto her dress. I have been there; I'm sure many of us have. Those are the kinds of moments that show truth and deserve admiration. Amber had two false alarms before her actual labor. Since she had already rushed to the hospital on two previous occasions, it would have made a nice juxtaposition to see her having a slower-paced labor. There was a big emphasis on Amber's relationship with her mother, Sarah, throughout this story. She was relying on her mother to help her since the father was not in the picture. Instead of having Sarah pick Amber up in the middle of the night and take her to the hospital immediately, why not have Sarah come over in the middle of the night and coach Amber through her contractions? A 20-second montage of this (pacing, crying, breathing deeply) set to emotional music and capped with them arriving at the hospital and the subsequent pushing (which they did show). I think that would have been a great way to honor their relationship without boring the audience. I will miss this show. I will miss its moments of truth amid the drama. But I do wish it had not downplayed this particular area of life. I expected more from a show that seemed so real. What are some ways this show touched your life? Are there other shows that portray parenthood in a way that seems very true (or very false)? I'd like to hear other's thoughts.